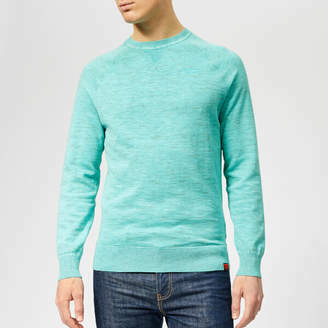 Crew neck jumper from Superdry with a garment dyed cotton construction to create a unique, distressed finish that will fade naturally with age during washing and wear. Features a V-stitch insert at the rib-knit collar, and raglan sleeves with seam detailing. Tonal embroidered branding to the chest. A ribbed hem and cuffs complete the pullover.100% CottonModel is 185cm/6'1 and wears a size M.